By Peter Anderson 12 Comments - The content of this website often contains affiliate links and I may be compensated if you buy through those links (at no cost to you!). Learn more about how we make money. Last edited February 10, 2014 . I‘ve been investing in Lending Club for quite some time now, and so far I've been extremely happy with the experience. I'm getting a good return on my money, while at the same time helping others to get loans at lower rates than they might have otherwise been able to obtain. I really do think peer-to-peer lending is here to stay. Check out my original Lending Club review and my post on my Lending club investing strategy. I haven't done an update for a while to talk about how my investments at Lending Club are doing, so today I thought I would do a quick post on the returns I'm currently seeing, the number of defaults I've experienced, and what my plans are going forward. So here's a quick look at my numbers so far. 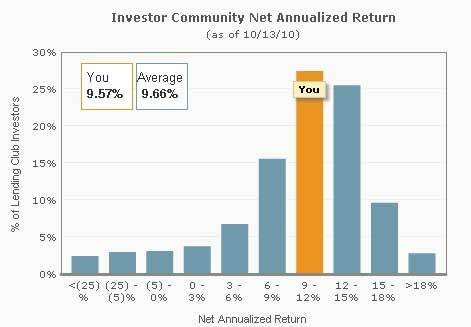 My Net Annualized Return is 9.57%: that number puts me in the 39th percentile. That means my return is higher than 39% and lower than 61% of all investors. I'm looking to improve on this. Zero defaults: I do currently have one loan in 31-120 day grace period, and if things continue as they are now the loan may default. The loan originally started out as an A grade investor with a credit score over 750. If you look at the borrower's credit score now, it's more in the 650 range. Not sure what happened there. Three loans have been paid off early over the last year: Two were A grade loans, and the other was one of my only C grade loans. As mentioned in my investing strategy post, up until this point I've mainly invested in A and B grade loans, with one or two out of 64 being C grade. Now one of my C grade loans has paid off their debt. 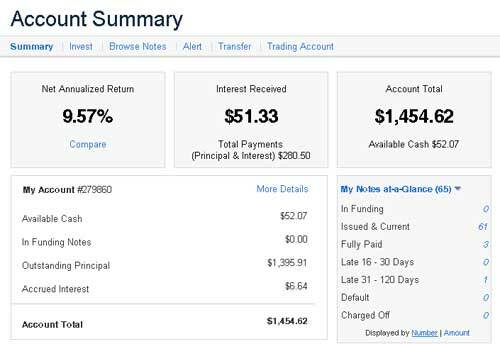 My account balance has continued to increase as I become more comfortable with using Lending Club as part of my investing strategy. I currently have $1454.62 in my account, and I'm sure I'll be adding more since I've had mostly good luck in using Lending Club. I'm still diversified by investing across a large number of loans with no more than $25 in each loan. That way if I do have defaults, while my return will go down, my risk will be minimized. While my returns thus far have been acceptable, especially since I've been investing in mainly what might be categorized as low risk A and B grade loans, after talking with some other folks I think that I can get higher returns with minimal added risk. I just have to be careful about which higher grade loans I accept. Over the past two to three months, I’ve shifted my risk to Grade C notes and higher. This is perceived to be higher risk based on the borrowers FICO score, however, I would argue the risk of many of these higher credit risk loan applicants is less than or equal to Grade A & B loan applicants simply based on their profession, job history, job security, payment histories, etc. My theory is those who keep their jobs, and have a solid history of repaying their debts, will repay their Lending Club loan. Less than $10,000: I believe I'll still be sticking with mostly loans below $10,000. Lower amounts mean higher likelihood of payback of the loan. A & B credit rating: This is where I'll be altering my strategy just a bit, accepting a few more C and even a few D grade loans. I'm not going to go overboard though. Debt to income ratio below 20-25%: I like to invest in loans where the borrowers have a lower DTI ratio. I'll try to keep this as is. Loans over 60% funded: When other people have invested in the loan, a lot of the times that means that they’re a better risk because others have done their due diligence and agreed to invest. Not always the case though so be careful. Borrower answers to investor questions: I like to ask questions from potential borrowers. You can tell a lot about someone, and about how they'll do repaying the loan, by how they answer the questions. So that's my strategy that I'm using right now. Basically the only thing I'm really changing or modifying for a test run is accepting a few more lower grade loans, and even maybe a few that have had delinquencies. Even with my adjusted strategy, I will still be careful about the loans i get into. The lower grade loans I accept will only be ones that have been deemed to be an acceptable risk based off of the borrowers job security, their profession, and past history of paying off debts. So what do you think of my evolving Lending Club investing philosophy? Do you think I'm making a wise decision? What investing philosophy are you using? Are you considering joining Lending Club? Tell me your thoughts in the comments! Sounds like you are doing OK. I was a lender for 36 years and I do agree that job stability and payment history are very good indicators as is debt to income. The FICO is also very important but as you have seen FICO can change fast. Great tool if you monitor it regularly. But the same could be said for payment history. I’ve been curious about the lending tree gig cause I’ve heard a lot about it, but just don’t know if im willing to swallow the potential risk. I’m gonna have to do a little more research before I’m ready to jump in. Glad it’s working out for you though. I felt the same way before I started, and then I finally jumped in when they were offering $50 free to invest – because there was no risk. Now a year or so later I’m doing pretty decent with my money in Lending Club, and I’ve found that it’s like any other investment – with risks – but that can be mitigated by careful research and buying into loans that are good risks. Good luck, I hope you try it out – and remember you can still get the $25 signup bonus! I think I’ll look more into Lending Club when I get more money to loan out. Right now I’m involved with microfinance loans through Kiva and have been really happy with their work. What do you think of Prosper (peer to peer lending) for investing? I haven’t used Prosper yet as I wasn’t as impressed with their interface/etc – but would be open to it at some point. Interested in hearing opinions from others about Prosper as well. How exactly are they verifying gross income/worth? I live in CA and would like to use Lending Club but I don’t make 100K/year. Is Lending Club going to report me to the authorities if I sign up to use their service? I would qualify for any other state, just not CA. California Residents: I confirm that I (a) have an annual gross income of at least $85,000 and a net worth of at least $85,000 (exclusive of home, home furnishings and automobile); (b) have a net worth of at least $200,000 (determined with the same exclusions); or (c) will invest no more than $2,500 in notes if I do not meet either of the tests set forth in (a) or (b). In addition, I agree that I will not purchase notes in an amount in excess of 10% of my net worth, determined exclusive of my home, home furnishings and automobile. Sweet. I’m going to get going once they verify my bank account. Do you know if Canadians can use Lending Club? If not, do you know of any peer to peer lending sites in Canada? I remember watching a news program about a micro lending site geared towards the developing countries. I don’t believe that Lending Club is available in Canada, but someone on one of the forums mentioned a site called http://www.communitylend.com/ available to Canadian users? I can’t vouch for it, but it seems legit. As far as micro-lending, I think you may be referring to Kiva.org? We wrote about that a while back here. Thank Peter; I googled peer to peer lending Canada & found the site you mentioned however after reading it I wouldn’t qualify as I am not an “Accredited Lender” i.e. assets over $1 million or make $300,000 per year. I will look into Kiva as it looks very interesting. Once again, thank you and keep up the great work. Hi, Dan Villarreal here, American expat and resident of Taipei, Taiwan. I’ve run across a lot of Red Tape in such diverse areas as renewing my Texas Driver’s License, wanting to invest in Vanguard and be a Boglehead, and lots more, simply because of not having a US-based address. Do you know if anybody like Lending Club lets us expats participate? Next Post: Dave Ramsey’s New House: Did He Follow His Own Advice And Pay Cash?